In addition to doing letter of the week with Chaos, I also began Before Five in a Row with Wild One. This week we talked about the Letter M. Here are the crafts we made (again while listening to the music on the Hooked on Phonics software). 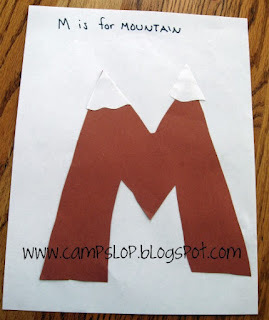 We started by creating our uppercase letter craft - Mountain M. The idea for this craft came from No Time for Flashcards. 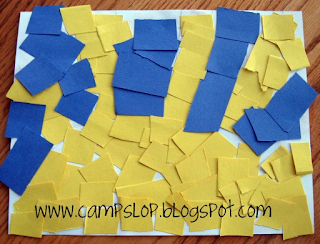 We did our usual pages: tactile letters, coloring page, color by number and handprint art. Sources are below. 1. 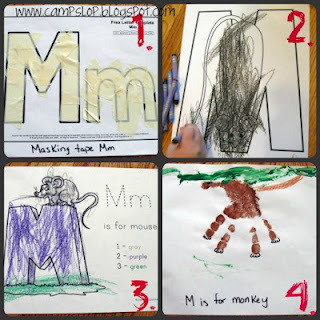 Tactile M (masking tape). The idea for this craft is here at The Active Toddler and the letter sheets were printed from Quality Kids Crafts. 4. 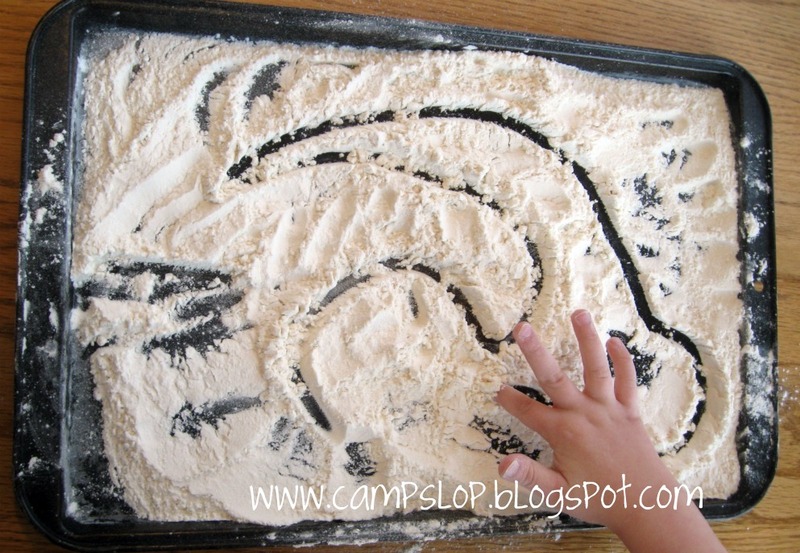 Monkey handprint art from this post at Handprint and Footprint Art. 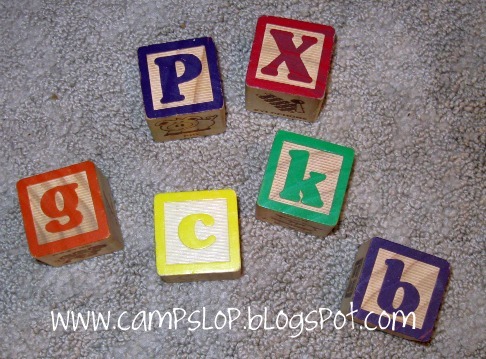 We had a lot of (surprise) fun with our wooden alphabet blocks. I originally brought these out for Sprout to stack, but Chaos took quite an interest in them. 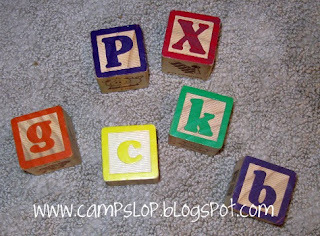 The blocks have a lowercase letter on one side and an uppercase on the other side. He would turn the letters over to lowercase side and try to guess which letter it was. He could simply flip it over to check if he was right. Next he pulled out his alphabet poster (from the Hooked on Phonics set) and matched the blocks to the letters on the poster. He also did a lot of lining up the blocks in order and pointing to them as he sang the alphabet song. I love it when impromptu learning fun happens! Don't worry - we did our share of building and knocking down towers too! Our favorite non-craft activity was writing in flour! I thought this would be a fun way to have Chaos practice his writing. 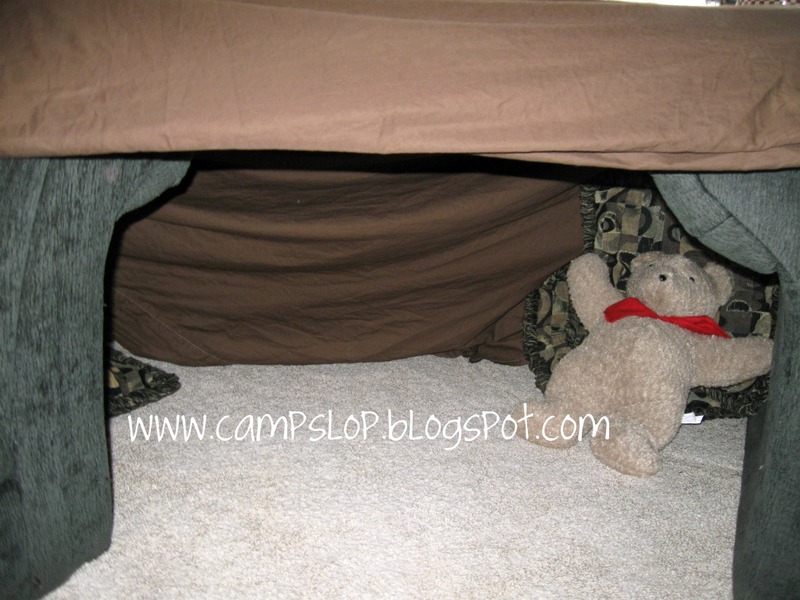 He had so much fun with this! Even Pinky decided to join us. It made a big mess, but it was worth it. Finally, we did letter hunts using the Letter Hunt worksheets from COAHS and the nursery rhyme pages from Education.com. After doing a lot of reading, I decided to give BFIAR a try with Wild One. She's always loved, loved, loved books. We will stick to only play activities (no lapbooks or worksheets) because she is so young. It's my hope that this will be a fun way for us to "hang out" together while the older kids are at school. 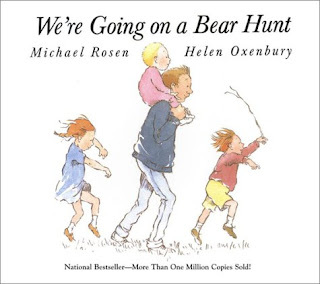 The first book we "rowed" was We're Going on a Bear Hunt. We had read it before, but this was the first time Wild One really LOVED it. She even carried it around with her everywhere we went. I'm not sure what made it "click" with her, but it certainly made this week fun! 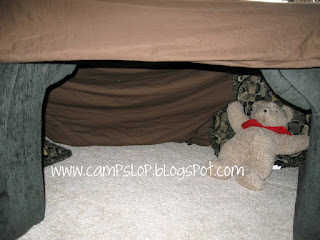 The first day we read the book I built a cave (out of an old sheet) for us to explore - complete with a bear too! She was initially terrified (whoops! ), but once she saw Pinky and Chaos exploring, she was excited too. Wild One really enjoys coloring so I was really excited to find this coloring page at scholastic.com. 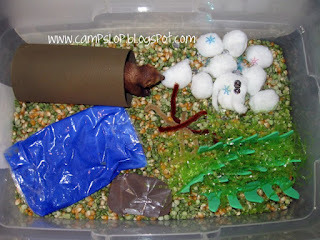 I made her her first ever sensory bin based on the idea here at Delightful Learning. The base is corn and split peas (leftover from our St. Patty's day bin last year). I used green foam sheets and Easter basket grass for the grass, cotton balls, snowflakes and sequins for the snowstorm, pipe cleaners for the roots of the trees in the forest, shaving cream and blue paint (well sealed in a plastic bag) for the river, brown foam for the cave and brown foam covered in contact paper for the (sticky) mud (we were all out of brown paint). I added a small toy bear to complete it. She was a little unsure of what to do at first, but Chaos helped her. They eventually grabbed some dolls from her dollhouse and reenacted the book. We also tried our hand at sound effects using the ideas here at Reading Confetti. Throughout the week we also turned the book into a game for wherever we were going. When we picked Pinky up from school we were "Going on a Pinky Hunt" and I made our trip into it's own story (mud in the front yard, bumpy road to drive on, playground to walk through, etc). Wild One had a lot of giggles for this game and wanted to play nonstop. Coming up next week: Letter T, Goodnight Moon and fun with Pinky! 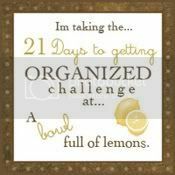 What wondeful activities! I love your sensory bin! Fun week! We made that bin when we rowed Going on a Bear Hunt. Popping in from pre-k corner. What a great row, I love the cave! A very busy and fun week indeed! Another fun and busy week! 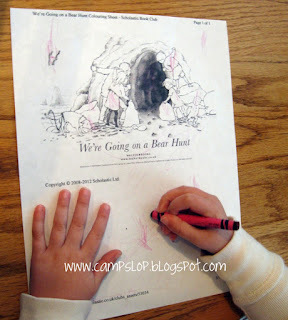 What fun...I love the bear hunt! 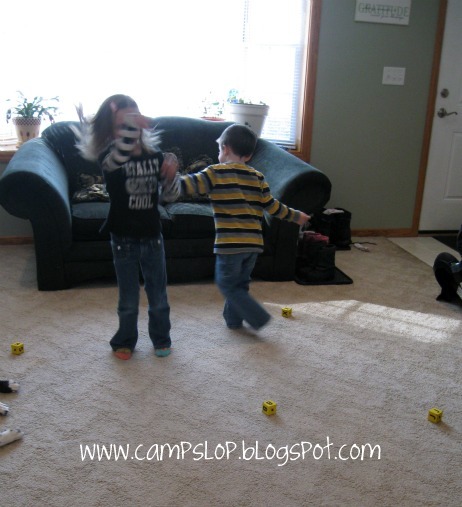 Thanks for sharing this on Hey Mom, Look What I Did at Adventures In Mommy Land! !